Today I wore this beautiful polish from Glitter Gal. This is Lavender Sparkle. You don't see the Glitter Gal sparkle polishes getting much love around blogs, and after wearing this I just don't know why. Looking at the bottle I was worried it was going to be a watery sheer mess, but to my surprise it was opaque in just two coats. The sparkle in this polish is not holographic glitter like other GG Sparkle polishes I have. This has an amazing shimmer that almost makes you nails look like they are covered in frost. Its generally a silver shimmer, but when you look closely at it you can see fine pink and blue sparks coming through. 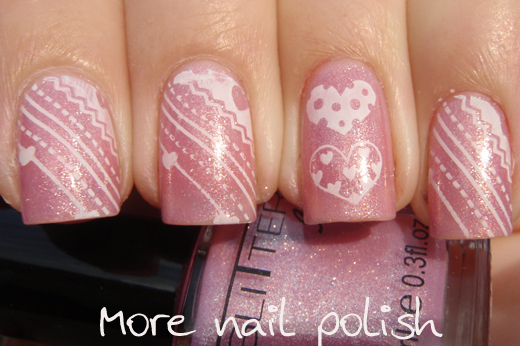 This polish was the perfect pink to base for some more Valentine stamping. I know these aren't very fancy Valentine nails, but I was happy with the final look. Sorry, spot the stupid cat hair! I'm working on some fancy designs using water decal paper, but I really need the weekend to put some time into them. One reason I really do love stamping is because it's a quick and easy way to add nail art, especially when you've got home from work, got dinner on the table, bathed the littlies, got them to bed, edited your photos from that morning and done a blog post. Then it's finally time to change you mani and it's already 10pm. 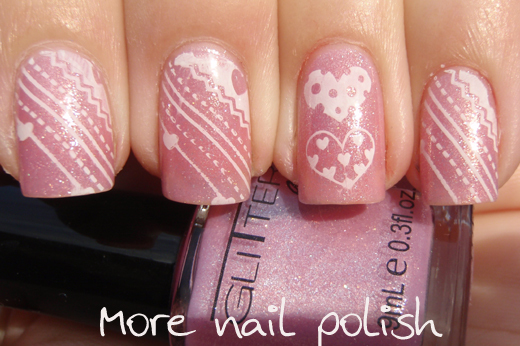 But just add some stamping and you have nail art that never fails to impress muggles! I've always liked Glitter Gal, but the only way I can get them is to order from Amazon. This is really pretty. BM plate right? Hey Lakesha! Have you ever been to shop.llarowe.com? 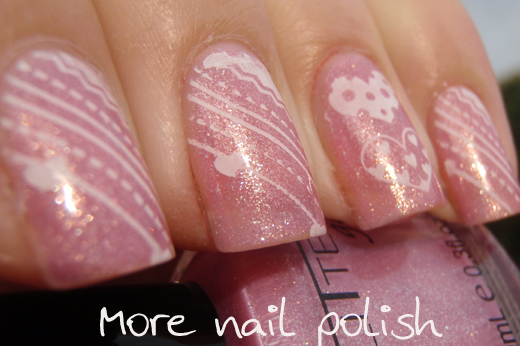 She stocks Glitter Gals (as well as some other lovely polished from out of the country). She's great! Cheers! Yeah BM plate for the stripes, Konad plate for the hearts. Sorry Glitter Gal are hard for you to get. I'm looking forward to seeing their new shades. 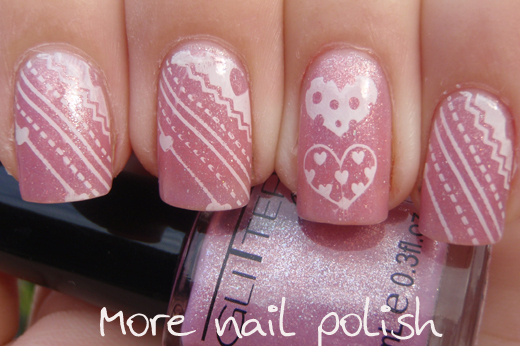 That V day mani looks amazing! This is very pretty! The Glitter Gal holos definitely outshine the sparkle colors though. I still have to try this brand. All the pictures I've seen are amazing! This is so pretty and soft, and feminine. You have gorgeous nails, too!! 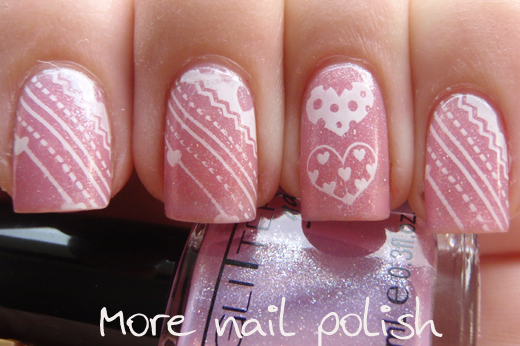 I was trying that stamp (The one one 3 of your nails) but I just couldn't get it to look right on me. I love this!